The United States Hockey League has not always been a consistent producer of young talent, but with the rise of college hockey, the USHL has developed two potential first round picks for the upcoming NHL Entry Draft. 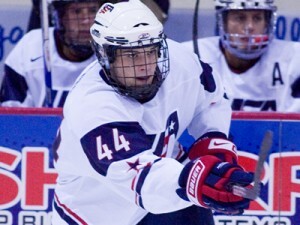 The first is Tyler Biggs, a 6-foot-3 right winger and product of the Team USA Under-18 Development Program, who is the eighth highest rated prospect by the International Scouting Services. Along with Biggs is Rocco Grimaldi, a 5-foot-6 speedster who has drawn comparisons to Canadiens forward Brian Gionta and Buffalo’s Nathan Gerbe. Neither player is a sure fire prospect, but both have an impressive array of skills that are projectable at the NHL level. Biggs is a power forward with great speed for a player of his stature. His most tantalizing attribute is his strength and ability to fend off opposing defenders en route to the net. There aren’t many 17-year olds with the same size and aggressiveness as Biggs, let only players in their early 20’s. Entering this season, Biggs wasn’t even rated amongst the top-30 draft eligible players, but has elevated his game after a standout performance at the World Under-17 Championships. 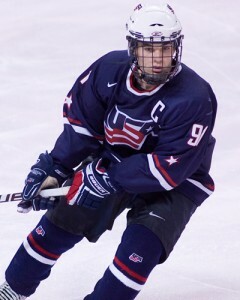 He notched five goals, including the game winner in Team USA’s gold medal game against Ontario, and also added an assist in six games. In 19 games with the national development team, Biggs equalled his point totals of last season with seven goals and four assists for 11 points in 19 games. The Team USA captain has committed to Miami University for next season, where he will likely spend at least two seasons before turning pro. USA teammate Rocco Grimaldi, who leads the team with 25 points in 22 games, has higher upside than Biggs, but is often knocked for his lack of stature. At only 5-foot-6, Grimaldi compensates for his lack of size with an excellent package of skills. He is an incredible skater with quick hands and a good vision on the ice. Currently ranked 18th overall, Grimaldi may need several seasons in the American Hockey League to adjust to the rigors of the pro game. However, his ranking does not reflect his skill set and potential to be a top-six forward in the NHL. With the draft almost three months away, the presence of USHL players in the first round will be a prominent storyline. For Biggs and Grimaldi, the competition between teammates will heat up as the two forwards aim to boost their respective draft stock’ as the season nears its conclusion.